Filthy with glitz, glamour, and gangsters, Prohibition marked the origin of organized crime. 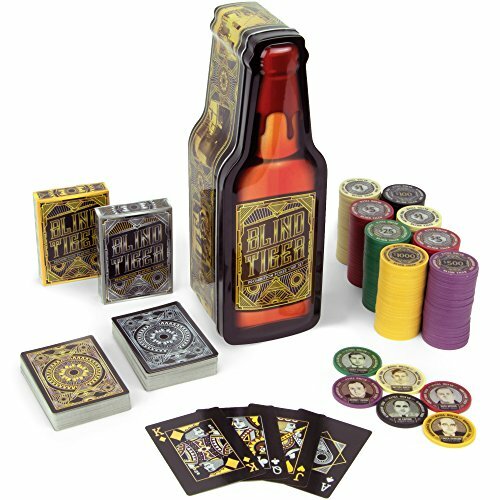 Each poker chip in our Blind Tiger poker chip tin gift set immortalizes one of its most famous mugs, and our black playing cards feature gilded art deco aces and custom face cards with nods to gats, grifters, gaspers, and gin rickeys. GLITZ & GLAMOUR: Includes one gold deck and one silver deck of custom black playing cards with custom gun-toting face cards and art deco aces, sized poker wide 2.5" x 3.5"